A detailed survey of the waters around the country's most westerly point may settle international disputes over ownership. Scotland has reaffirmed its ownership of a small disputed rocky outcrop in the Atlantic sea with a detailed map of its surrounding waters. The 19-metre high islet of Rockall, 187 miles west of St Kilda, has been disputed over for decades by Ireland, Iceland and Denmark, acting on behalf of the Faroe Islands, for the valuable fishing rights in its surrounding waters. 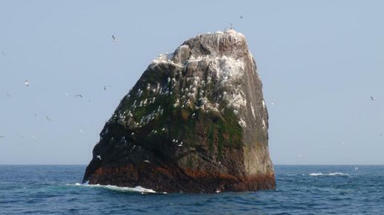 Rockall is a renowned fishing ground and supports large stocks of haddock and monkfish. It was claimed by the United Kingdom on September 8, 1811, by Royal Navy officer Basil Hall, who led a small landing party from the frigate HMS Endymion to the summit. However, the United Nations has committed to examine the competing claims under the UN Convention on the Law of the Sea. Environment Secretary Richard Lochhead said Scotland has "reaffirmed" its possession of Rockall through a survey that has produced the first high-resolution map of the surrounding seabed and reefs. He said: "The far flung islet of Rockall, out in the rough waters of the Atlantic Ocean, forms Scotland's most westerly point and is more than 180 miles from the nearest landmass in the Western Isles. "Over the decades this enigmatic rock has been the subject of international disputes over ownership, a magnet for adventurers and even a location for pirate radio broadcasters. "It's fantastic that Scotland has reaffirmed our possession of Rockall through this survey, which enabled a new high definition map to be developed, uncovered amazing underwater features, as well as studies of the marine life found around Rockall and Helen's Reef." The research collaboration between Marine Scotland and Scottish Natural Heritage (SNH), carried out in the summer, revealed an array of underwater reefs, pinnacles and ridges. The survey took place in July aboard the Marine Research Vessel Scotia, with multibeam echo-sounder swathes of the seabed used to compile an accurate, high resolution map. Underwater video footage was also taken and specialist traps were used to assess fish distribution in the area. The research forms part of a programme of surveys Marine Scotland is taking forward throughout 2011, in co-ordination with partner organisations, to improve knowledge of Scotland's seas. Francis Neat from Marine Scotland, chief scientist in the Rockall survey team, said: "Rockall has a rich natural history and supports some very valuable fisheries. "In the past we've faced ferocious weather conditions that have prevented survey work around Rockall taking place. However, this year we got lucky - the sea was calm and the quality of the data gathered is excellent." He added: "Our goal is to support long-term, sustainable fisheries while ensuring appropriate marine conservation and the new data of the Rockall area will help us achieve this." Susan Davies, SNH Director of Policy and Advice, said: "The underwater terrain of this commercially and environmentally important area was, up until now, almost unknown and this work has provided a great insight in that respect."